That would look cute on my girlfriend. And regardless, she thinks this shirt is really cute, so I might order it in the future. Considering the cancellation wave, Mega Man really needs luck. 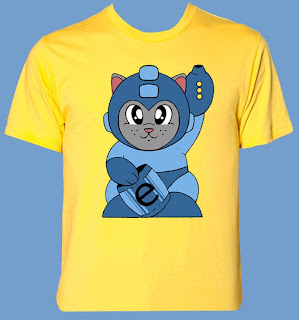 For the next shirt, do a Leprechaun Proto Man! Or Zero fighting against Childre Inarabitta and taking his foot! your girlfriend has brainwashed you.. Very cool shirt. Might get it for a girl I know.